There was one of these billboards just across the line in Randolph County when I was a youngster. Last week, PBS aired Klansville U.S.A., a documentary about Bob Jones and the Ku Klux Klan in North Carolian in the 1960’s. It was one of the most interesting films I’ve seen in quite a while and I highly recommend it. The basics presented weren’t exactly news to me, as I grew in the 60’s and 70’s knowing that the Klan not only existed, but that some of the people in my community were most likely members. Hell, as the caption in the picture above states, there were billboards across the state attesting to that fact. 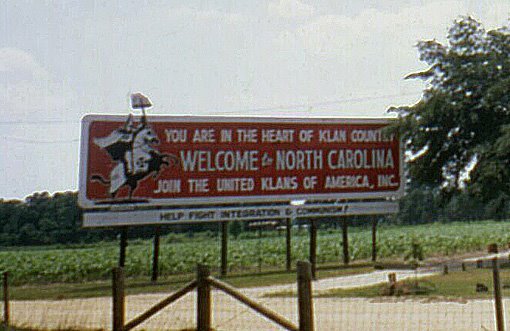 But, I did not know that the North Carolina chapter of the United Klans of America was the largest in the country in its heyday, boasting 10,000 dues-paying members. Coupled with the fact that North Carolina has long been considered the most progressive state in the South((a reputation our “esteemed” legislators seem intent on trashing)), this fact illustrates the weird relationship many southerners have with race relations. While I found all that interesting, the characterization of Bob Jones had me absolutely riveted. Jones was a working-class guy from Salisbury, NC who drifted from job to job, was kicked out of the Navy in the 1940’s for refusing to salute a black officer and found his raison d’être as the most influential Klan leader in the country. As I watched a couple of interviews with him, I was struck at the ease with which the word “n***er” rolled off his tongue. And, like many southerners of the time((Hell, like many southerners today)), Jones had no real animosity toward his African-American neighbors…, as long as they knew their place and stayed in it, of course. His father was a Klansman during its early 20th century resurgence and Jones liked to boast that his mother marched with the local Klavern while she was pregnant with him. Right about now, you’re probably wondering why someone like Bob Jones would capture my attention that way. It’s because I could easily have turned out just like him. I also grew up in a working-class family, the descendant of farmers and mill hands. I drifted from job to job until I found my raison d’etre in the fire department. Hell, I was even kicked out the Air Force((not because I wouldn’t salute a black officer, though)). Racism was present in my own family, too. My grandfather never hesitated to drop an “N-bomb” and was incensed at Hank Aaron breaking Babe Ruth’s record. My dad loved tell my brother and I racial jokes and broke out a few “N-bombs” himself over the years. And, as I got older, it was rumored that at least one fellow volunteer firefighter was a card-carrying Klansman((A rumor he did nothing to dispel)). Add to that the fact that I was a white kid during the civil rights movement, a time of great upheaval in the South and a racially charged atmosphere was impossible to avoid, and even I question how I didn’t become the next Bob Jones. So, what happened? Why didn’t I turn out like Jones or the people I knew growing up with who supported the Klan, either through membership or turning a blind eye to it? My family, that’s what happened. Because, while my father and grandfather could say “n***er” with relative impunity, that was a short cut to getting my mouth washed out with soap (which was really a best-case scenario). Because some members of my family might not have always spoken kindly about African-Americans as as a group, they always treated individual black people with respect and kindness. Because, even though he loved telling those awful jokes, my father taught me that what mattered was a person’s character, not their skin color((he never said so overtly, but that’s the way he lived)). While all of that was important in making me who am I today, I think I turned out this way mostly because my family wasn’t afraid. I say that because racism and discrimination exist because of fear. Fear of what, you ask? In a word, change. Poor white people fought (and still fight) integration and equal rights for people of color not because they’re bad people, but because they’re afraid that if these folks achieve equality, they could lose what little they have. And, when you don’t have much, you’ll fight tooth and nail to preserve it. So, why didn’t my family succumb to this fear? At least part of it can be attributed to our economic situation. My father worked for the U.S. Post Office, which was about as secure as jobs got in those days. My grandfather drove a truck for Southern Railway, which almost as good. But, there was also a strength in my forebears that wouldn’t allow them to blame their misfortunes on others. When hours got cut and money was tight, well, you took your belt up another notch and did whatever was needed to get by. You did not, under any circumstances, waste time finding someone to blame for your bad luck. Were we that different from other families? I don’t think so, but sometimes I wonder. I realize this an odd post for Martin Luther King Day, but I believe it’s more honest than anything I could write about Dr. King. Don’t get me wrong, I admire the man and am astounded at what he accomplished. But, as a white man born and raised in the South, my journey is vastly different from King’s and that of my friends and neighbors of color. But, those paths intersect on a regular basis and we have to find a way walk together when they do. That only happens when we see each other as human, not rednecks or n***ers.